If you fancy something to nibble of an evening but don't want to use your syns, this is a very good alternative. You can vary the spices according to what takes your fancy. 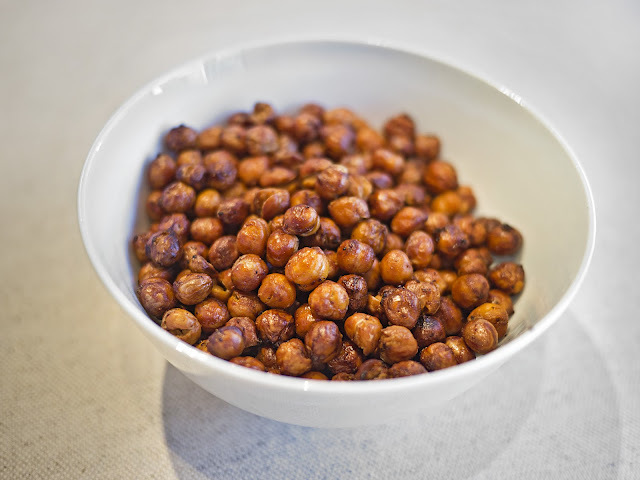 Drain and rinse the chick peas. Mix well with the olive oil in a bowl and add the salt and spices. Stir to ensure the peas are well coated. Bake in a single layer on a baking sheet at 200°C for 30-40 minutes until crisp. You need to stir them and rearrange them on the baking sheet several times during cooking, as the outside ones will brown quicker then those in the middle. It is really a bit of a trial and error thing on the timing, keep testing them until they are crisp, and keep an eye on them so they don't burn. I think they're worth it though.